The Cordova engine provides a hardware-accelerated wrapper around HTML5. 1) Before the Cordova projects can be created, be sure to install the Cordova Command-Line Interface. 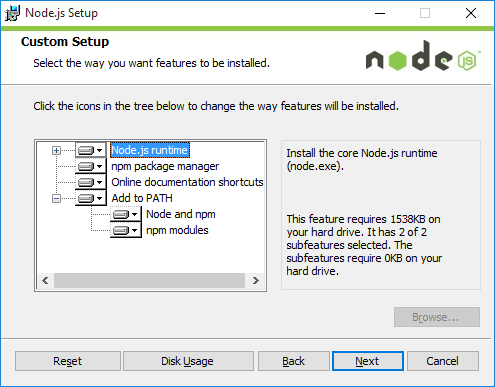 On Windows, Node.js can be installed from an MSI installer and be sure to add 'Node and npm' to the path. 3) Be sure to install a GIT source-control client. Cordova will report errors if git is missing from the path. 4) Open a new terminal to install Cordova globally. 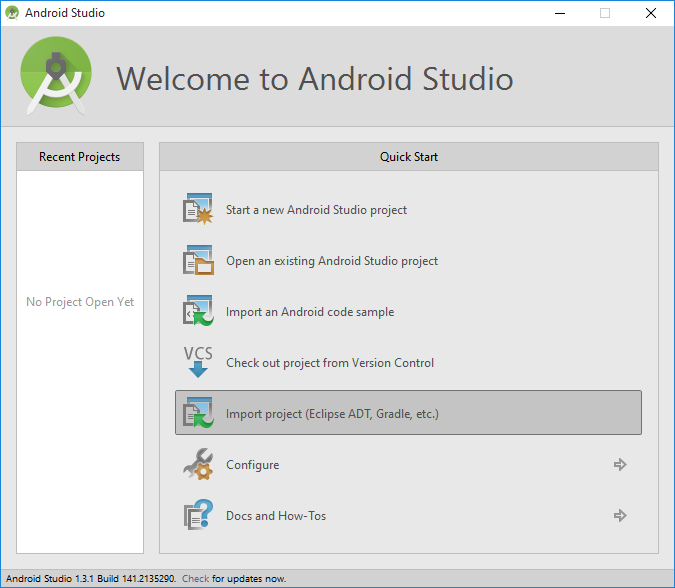 Be sure to update to the latest version of Android Studio. 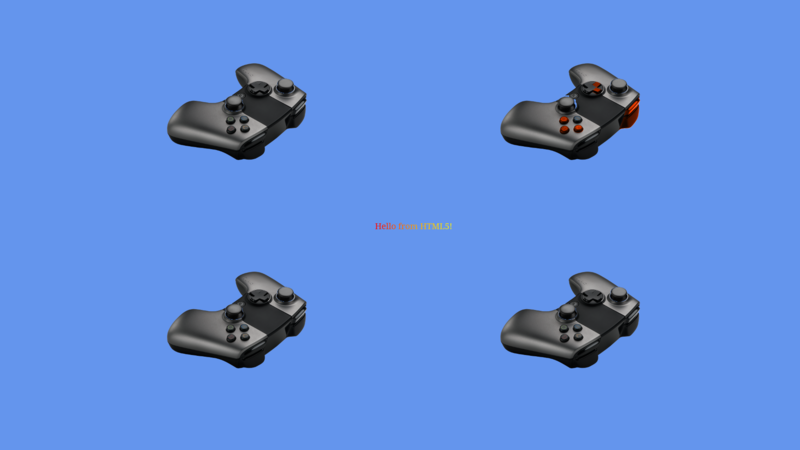 The Virtual Controller example shows 4 images of the OUYA Controller which moves axises and highlights buttons when the physical controller is manipulated. 1) The initial VirtualController project was created with the command-line from the Cordova folder. 2) Android support is added to the Cordova project with the following command-line from the Cordova/VirtualController folder. 3) Use the Cordova command-line to add the cordova-plugin-ouya-sdk plugin. 4) To build and run the Virtual Controller Example run the following command from the Cordova/VirtualController folder. 5) Manually copy plugins\cordova-plugin-ouya-sdk\src\android\MainActivity.java to platforms\android\src\tv\ouya\examples\cordova\virtualcontroller\MainActivity.java and edit the package name to be tv.ouya.examples.cordova.virtualcontroller. Cordova auto-configs cannot replace XML nodes making this manual one-off necessary. 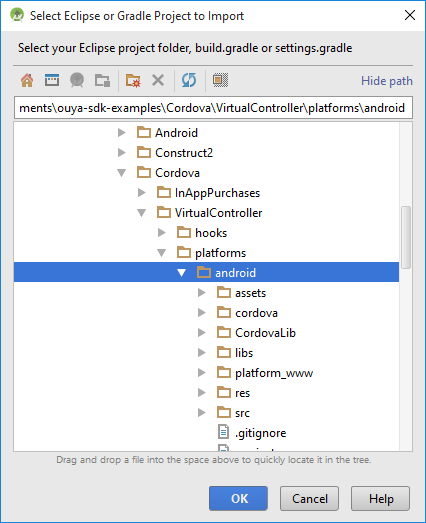 6) Replace the Cordova\VirtualController\www content folder with the Virtual Controller example HTML5 so that the cordova run android command will embed the files into the Android platform. 7) Cordova projects can import into Android Studio as a Gradle project. 8) The example project can be imported from the Cordova/VirtualController/platforms/android folder. 9) Customize the AndroidManifest.xml to include the leanback-icon. Cordova requires a target version of 22. The In-App-Purchases example shows making purchases, checking receipts, adjusting the safe area, and exiting the app. 1) The initial InAppPurchases project was created with the command-line from the Cordova folder. 2) Android support is added to the Cordova project with the following command-line from the Cordova/InAppPurchases folder. 4) To build and run the In-App-Purchases Example run the following command from the Cordova/InAppPurchases folder. 5) Manually copy plugins\cordova-plugin-ouya-sdk\src\android\MainActivity.java to platforms\android\src\tv\ouya\examples\cordova\inapppurchases\MainActivity.java and edit the package name to be tv.ouya.examples.cordova.inapppurchases. Cordova auto-configs cannot replace XML nodes making this manual one-off necessary. 6) The example HTML5 contents are placed within the Cordova\InAppPurchases\www folder so that the above command will copy the files to the Android platform. 8) The example project can be imported from the Cordova/InAppPurchases/platforms/android folder. To interact with Cordova plugins, first add Cordova includes in the head. Register the Cordova input hooks to receive HTML5 input. Wait for the document to load before making calls to the Cordova API, by using the body to register the onload callback. Your HTML5 page can set callbacks in order to receive events from Cordova for Axis and Button events. The Integer PlayerNum is zero based (0, 1, 2, 3) and indicates which controller had the axis event. The Axis is the integer Axis Number. Val is the float value of the input for that axis. The Integer Button is the button in the event. The key down event indicates a button was just pressed. The key up event indicates a button was just released. The plugin methods are defined on the OuyaSDK object. The developer id is displayed in the developer portal and is used to initialize the OUYA Plugin. Avoid invoking IAP methods until after the OUYA Plugin has been initialized. Upon success, the onSuccess callback will be invoked. If the initialization fails, the onFailure callback will be invoked. initOuyaPlugin supports additional strings to make the game compatible with OUYA Everywhere devices. tv.ouya.developer_id - The developer UUID can be found in the developer portal after logging in. com.xiaomi.app_id - The Xiaomi App Id is provided by the content team, email officehours@ouya.tv to obtain your key. com.xiaomi.app_key - The Xiaomi App Key is provided by the content team, email officehours@ouya.tv to obtain your key. tv.ouya.product_id_list - The product id list is a comma separated list of product ids that can be purchased in the game. The gamer info contains the username and gamer uuid. The onSuccess callback receives the gamer info. The onFailure callback receives an error code and error message. The onCancel callback invokes if the request was cancelled. The product info contains the description price information. The product parameter is passed an array of product identifiers. The onSuccess callback receives an array of product details. The purchable parameter is the product identifier being purchased. The onSuccess callback indicates successful purchase. The onFailure callback indicates the purchase failed. The onCancel callback indicates the purchase was cancelled. The onSuccess callback receives an array of receipts that the gamer purchased from the developer. 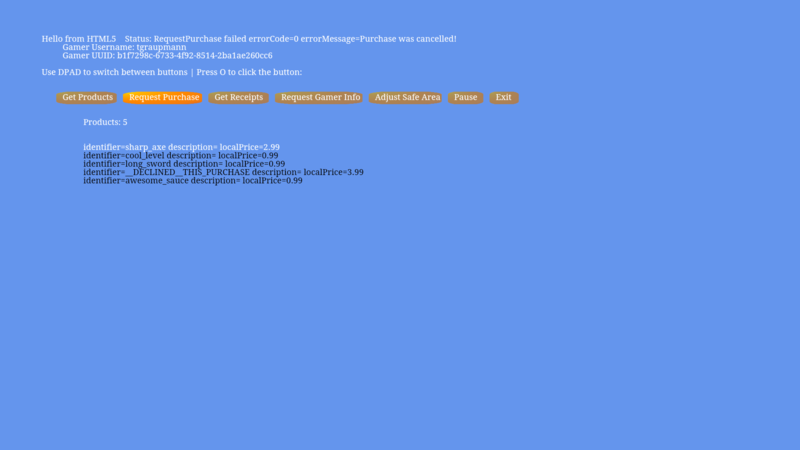 The onSuccess callback receives an error code and error message about why the request failed. The onCancel callback indicates the request was cancelled. The safe area is explained in detail in the content-review-guidelines. The safe area for HTML5 apps can be adjusted with setSafeArea. The amount parameter adds full padding with 0.0 and no padding with 1.0. The onSuccess callback indicates the safe area was set. The onFailure callback indicates the request to set the safe area failed. Device identification is part of OUYA-Everywhere. HTML5 apps can use device specific game logic and media using the name from getDeviceHardware. The onSuccess callback receives the name of the device hardware. The onFailure callback indicates the request to get the device hardware failed. The onSuccess callback receives the String name of the device hardware. The device name can be used to show an alternate set of buttons, for example. Shutdown provides a way to exit the HTML5 application. The onSuccess callback indicates the shutdown is about to happen. The onFailure callback indicates the request to shutdown failed.